We all know that monuments are different. But among them there are those that touch the subtle notes of the soul. At the same time, such feelings arise not only in adults, but also in children. 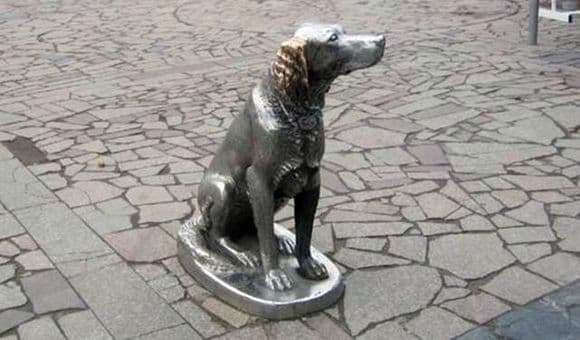 One of the most touching monuments in our country has become a monument to the most famous dog, the White Bim the Black Ear. A monument was erected in the good city of Voronezh. And the inhabitants of the city are infinitely proud that they have their faithful dog. Two sculptures, which began their work more than 30 years ago in 1985, made such a wonderful monument. At the same time, they invested only their own funds and, during the work, consulted the author of the story. It is a pity that he did not live up to the moment when the monument was installed. The White Bim Black Ear is a sad story, which was written by Gabriel Troepolsky, a native of the city of Voronezh. Therefore, it is very symbolic that the monument was installed here. The writer’s story struck everyone who read it. Also a very strong emotion caused the film, shot on the product. White Bim Black Ear is the most famous animal character and dog in our country. It is noteworthy that the story is known not only in our country. There are countries in which the White Bim Black Ear is included in the compulsory school study program. The monument was installed on the square in front of the puppet theater without a pedestal. This dog has become a symbol of kindness, devotion. Unfortunately, nowadays less and less people have such important qualities as dogs have. No wonder they say that the dog does not betray, but man can. Bim sits alone and waits for the owner, it makes me sad. But every resident of the city and not only considers it his duty to come and stroke the dog’s ear. And with so many people he is not alone, although Bim is waiting only for his best friend and master. From the fact that Bima is always stroked, his ear began to shine. Monument on the poll of all residents was the third in importance in the city. In 2009, he was recognized as one of the unofficial symbols of the city of Voronezh.